This smooth hydrating cream minimizes the appearance of fine lines and wrinkles around the eyes, an area which has a lower amount of both sweat and oil glands, making it highly susceptible to dehydration. Exclusively formulated with Vitamin B3, antioxidant Vitamins C and E and Aloe Vera, macadamia nut oil, cucumber extract, and peptide, this hydrating cream moisturizes and nourishes the skin around the eyes, significantly reducing the appearance of fine lines and wrinkles in the eye area in just seven days. Paraben-free, Dermatologist & Ophthalmologist tested (not tested on animals). 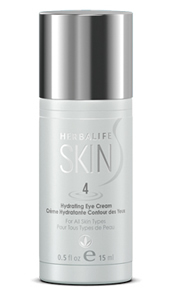 To complement your routine, use Herbalife SKIN Firming Eye Gel in the morning.